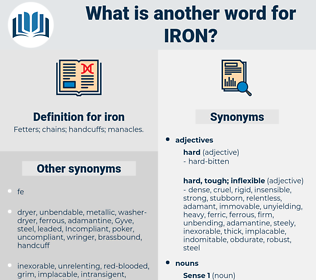 What is another word for iron? loose, soft, pliant, supple, yielding, slight, flexible, moving, weak. effete, spiritless, limp, wishy-washy, feeble, characterless, weak-kneed, spineless, insecure, weakened, listless, wimpy, uncertain, diffident, fragile. My lad, men build her of wood and iron, but there is something more in a good ship than wood and iron. 15 Years upon years went by, and at length one day Iron set out to visit his brothers. long iron, putter, niblick, wedge, mashie, driving iron, seven iron, one iron, midiron, short iron, nine iron, two iron, putting iron, five iron, Mashie Niblick. club, golfclub, golf club, golf-club.